The Comfort Touch Memory Foam Pillow is made with you in mind, no matter how you sleep, or what kind of pillow you like. 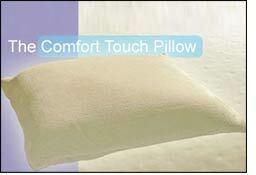 The Comfort Touch is self-adjusting, which means it can adapt to any sleeping style. We combine the versatility of a standard filled pillow with the comfort and pressure relief of pure, 100%, 5.5lb Visco-Elastic memory foam. And we back it all up with a 20-year warranty. It's simply the most versatile, comfortable, and durable pillow in the world.